This is a variation on the "Easy Does It!" super easy neckwarmer. 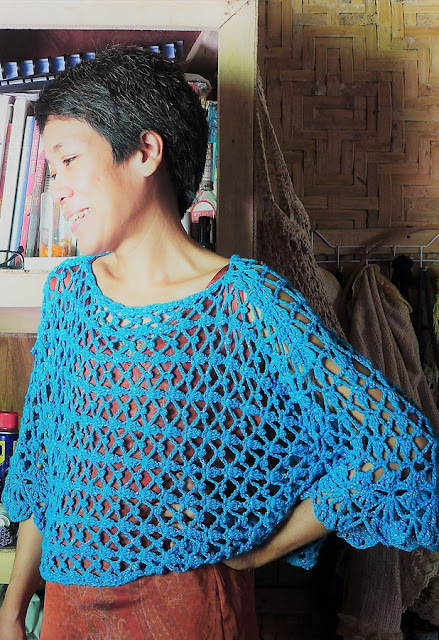 The ribbed texture is made possible by half-double crochet stitches worked in the back-loop of stitches in rows, making for good stretchy fabric. The twist takes advantage of this stretch and texture, plus the change in subtle colour, creating an elegant twist to a simple design. Substitute with DK / 8 ply (11 wpi) yarn that has good wool content for stretch, warmth and softness. You will need 20 grams of yarn of each colour. 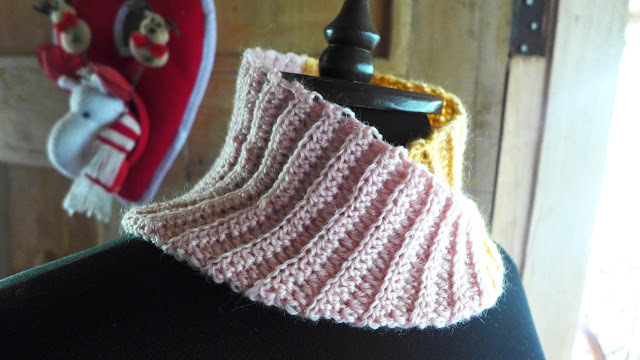 This neckwarmer is crocheted in rows flat, in one colour, then continued in a second colour. 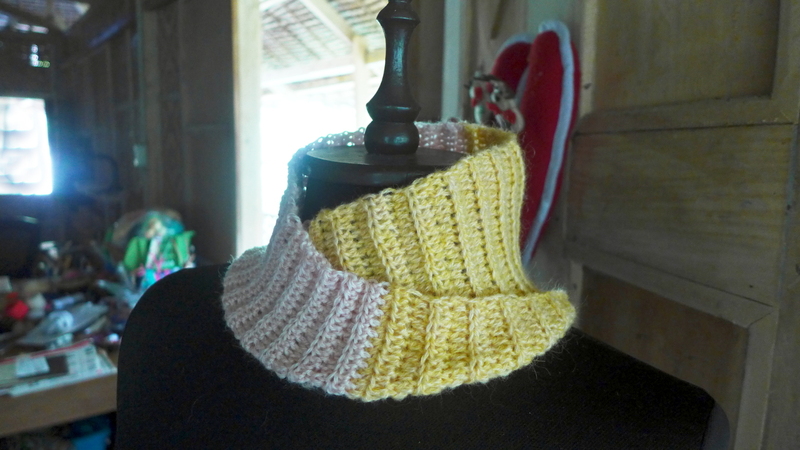 The neckwarmer is then twisted once and the ends crocheted together. 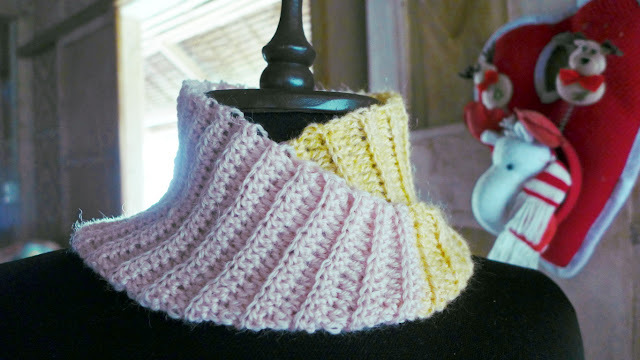 Choose softly complimenting colours to re-create the subtle colour lightness of the neckwarmer. Using suggested yarn and hook, starting 31 ch makes a neckwarmer 5.5" tall. Make shorter or higher as you require. The circumference is 20" which fits adult sizes with a bit extra to accommodate for the twist. Adjust to desired size accordingly. Row 1: Sk first ch, hdc in next ch, hdc in each ch across, 30 hdc made. Ch 1, turn. Row 2: Bl-hdc in each of next 30 hdc. Ch 1, turn. Working in both layers of stitches at ends of the piece, make sc in each of the 30 stitches. Fasten off. Weave in all ends. This is Twisty. 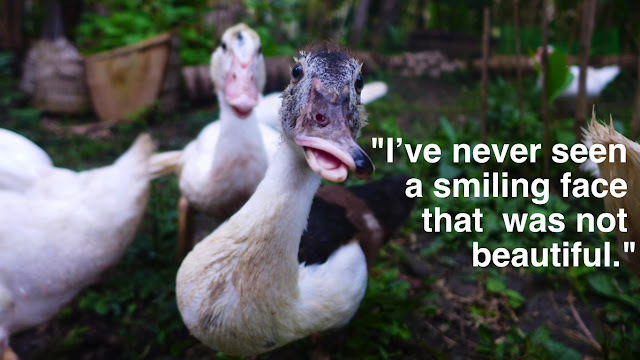 She was born with a deformed beak. The kid who brought her here said he had to help her out of her shell. I think her beak wasn't strong enough to break out of her shell. She has trouble eating, she can't pick up seeds quick enough before the others could gobble it all up. So we have to give her special treatment, we let her eat straight from the bucket! Awesome pattern. Will make beautiful gifts for my family this holiday season. Thank you.